Without the joy of friendship, lives are droll, boring things. 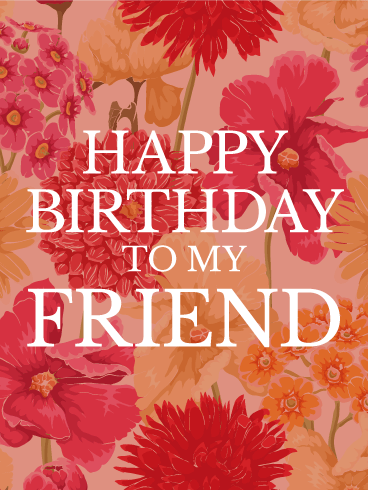 It's the people we meet that make life bright and alive, and there's no better time to celebrate that than birthdays. 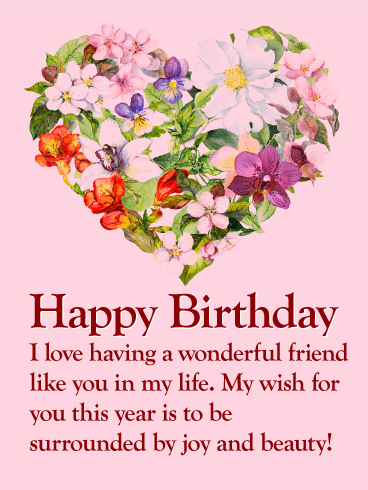 Wish "happy birthday" to your friend and then take it one step further with this colorful card to create a vibrate memory of this special day. 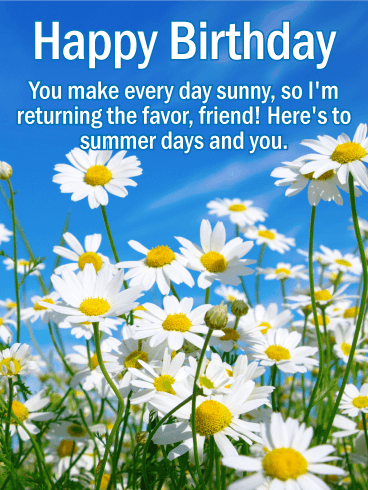 Let your friend know how much you appreciate them. Friends are the people who push you just a little out of your comfort zone, resulting in either growth or the most embarrassing of memories. Either way, you wouldn't ask for anything else. This year, for their birthday, wish your friend a brand new adventure and matching colorful tale. You may not live close by anymore, but you can still encourage each other. Send a bunch of courage this year, and get ready for a fabulous story next time you meet. No relationship is without its thorns, and friendship is no exception. But overcoming the struggles cements friendships forever. Celebrate your friend this year with a bunch of roses. Thank them for sticking with you, and help them have a delightful birthday. You are important parts of each other's lives and a birthday wouldn't be complete without a wonderful card like this one. When life gets you down, you need friends. They chase away the shadows, blow away the smoke, and what's left is a beautiful garden full of pastel colors. 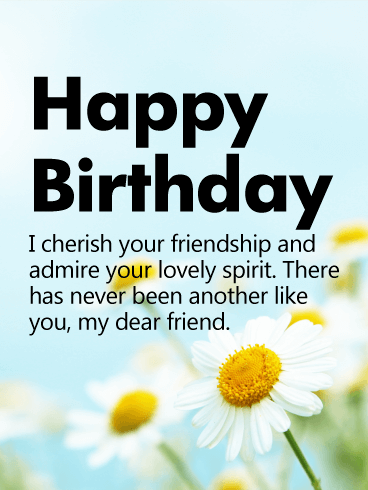 Friendships are some of the most important relationships we have, so make your friend's birthday this year a special one. Let them know how brilliant they are, how amazing, and wish them a year of peace and love. She's as beautiful as a bouquet of flowers and as pleasant as a summer day. 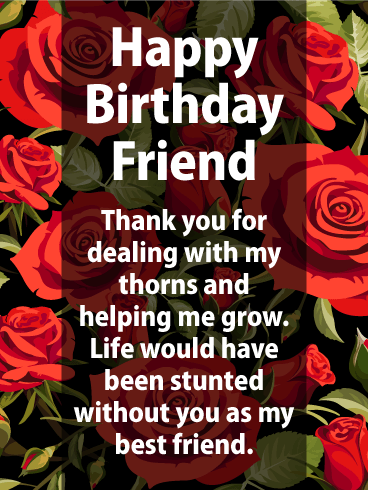 Your friend will appreciate being told so with this sweet birthday card. A background of flowers in shades of pink and purple with bright yellow centers makes for a charming display. 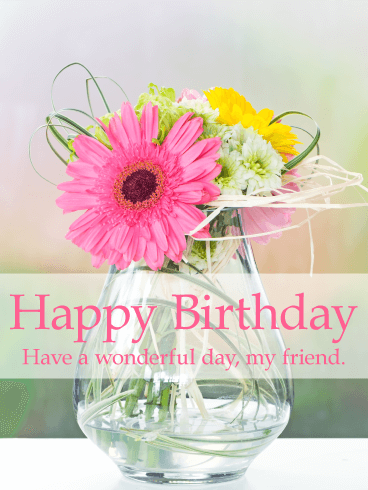 Your friend will enjoy receiving this bouquet of birthday wishes. Beauty and friendship are two of life's sweetest delights. 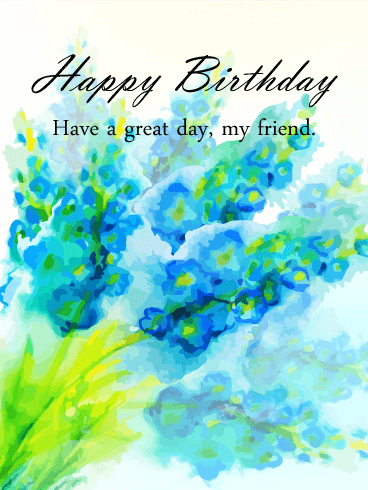 If you have a treasured friend, send this gorgeous watercolor flower birthday greeting card to her. 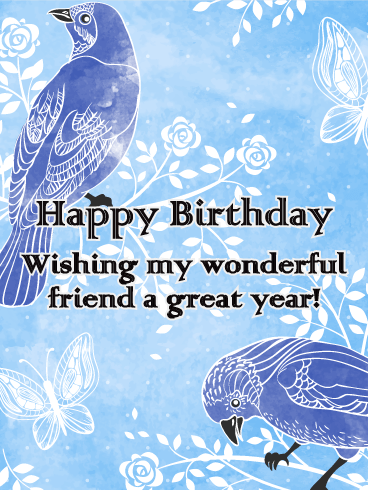 This elegant and thoughtful birthday card offers the warmest of wishes to the dearest of friends. Take a moment and send a greeting card that's truly touches the heart. 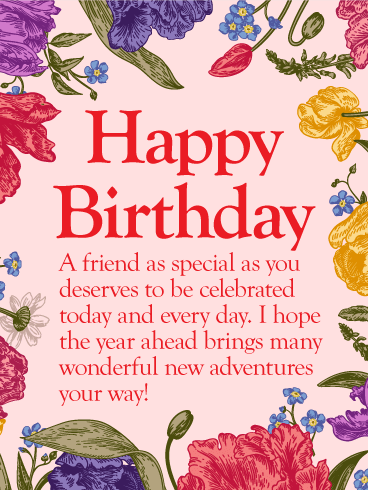 May your friend's birthday be every bit as lovely and delightful as she is! 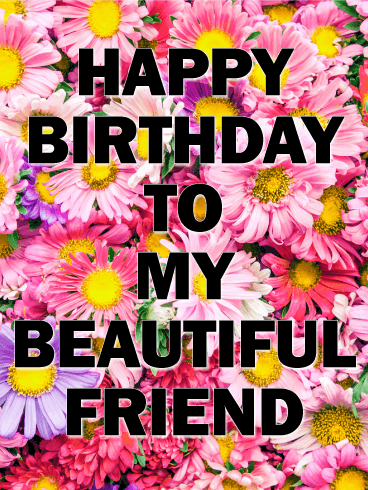 A beautiful floral background, with big, bold letters in front, help wish a special friend the happiest of birthdays! 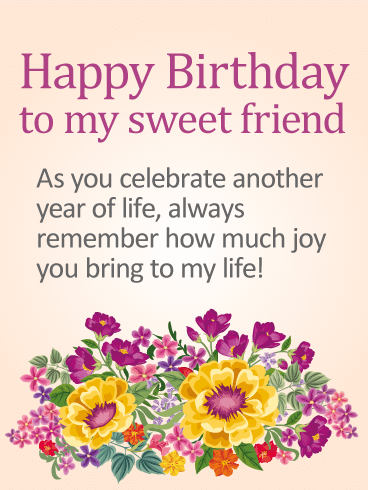 This birthday card was created to bring a bright smile to somebody's face as they celebrate another year. And while the words may be simple, they say a lot about how you feel while reminding someone how much it means to have them in your life. 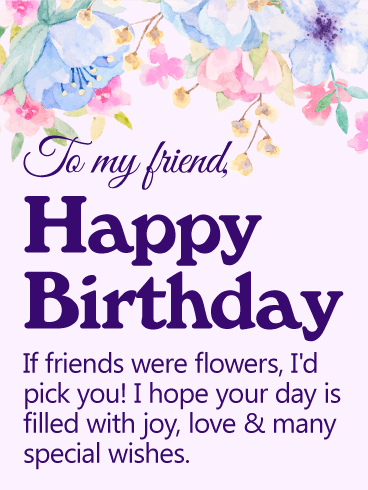 A soothing purple background is framed by a garden of pretty pastel flowers at top, helping you wish a dear friend a very happy birthday. The heartfelt message below will remind them how much their friendship means to you while making sure they know what this day is all about: "joy, love & many special wishes!" 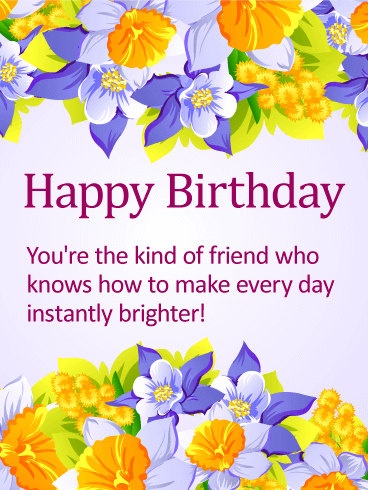 An awesome friend in your life will be beaming when they see this cheerful birthday card! A brilliant yellow background is highlighted by pair of sweet pink daisies to represent the special bond of friendship you share. 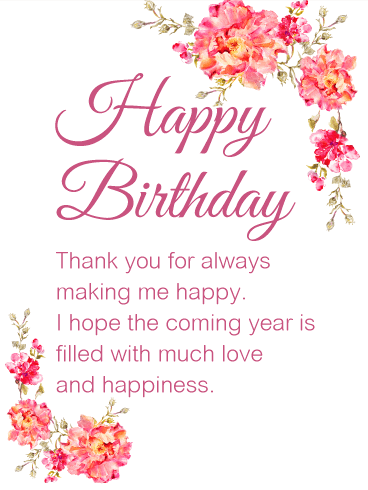 What better way to let them know how happy you are to have them by your side while wishing them the best & brightest birthday celebration ever! 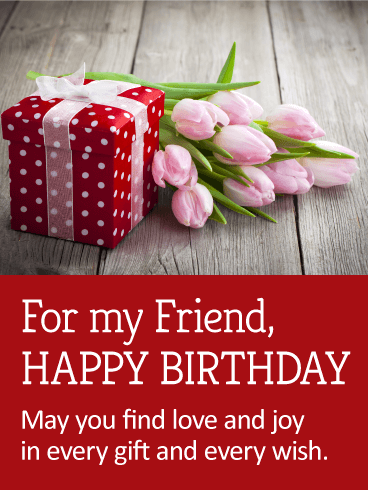 A special friend deserves a special birthday greeting. 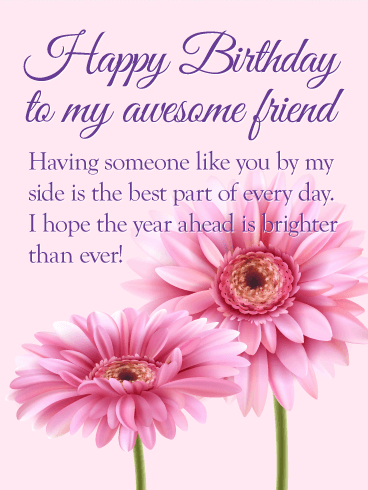 This lovely birthday card is highlighted by a heart filled with beautiful flowers against a sweet pink background. Right below is a wish for them to be "surrounded by joy and beauty" in the year ahead. What a wonderful way to remind someone you care about how much you love having them in your life. A delicate and endearing greeting. 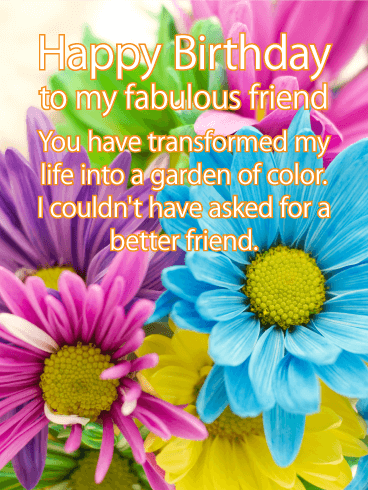 Send your cherished friend this warm birthday message. 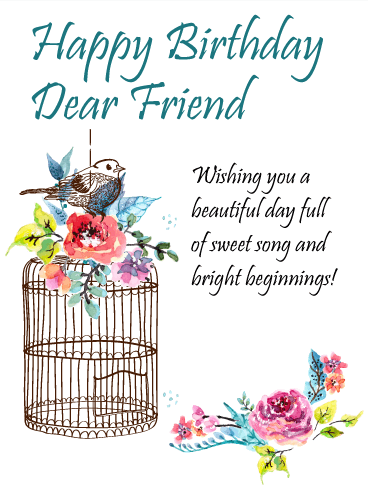 Beautiful flowers and a sincere message are a perfect choice for a sentimental friend with an ear for poetry and prose. 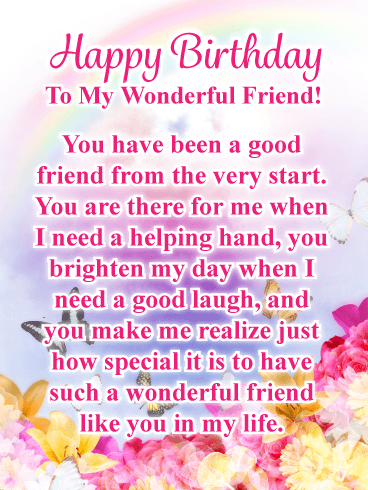 Wish a very happy birthday to your friend with this lovely birthday greeting card. It's the simple pleasures in life that mean the most. 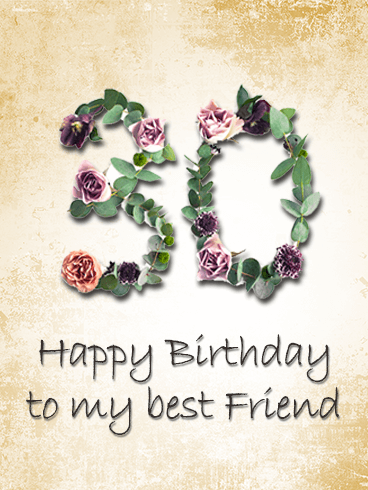 A thoughtful birthday card is one of those simple ways to bring lasting joy into another's life. Do you have a friend who is as elegant as she is sweet? 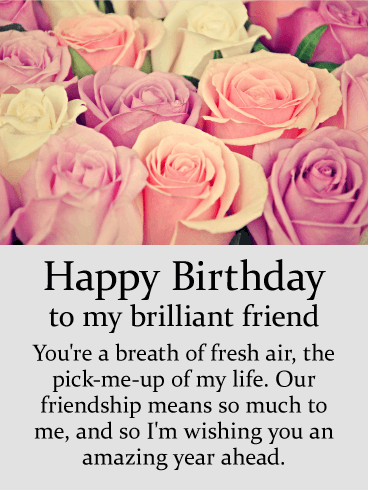 This beautiful Happy Birthday card is the perfect way to say "Happy Birthday" to the princess in your friend group. When she sees the delicate pink flowers and swirling glitter, she will know you picked the perfect card! Make your friend feel extra special this year on her special day! Birthdays are the best time of the year! 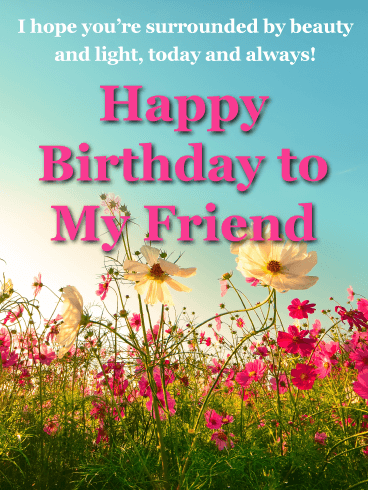 Help your friend have the best birthday ever with this beautiful Happy Birthday card! 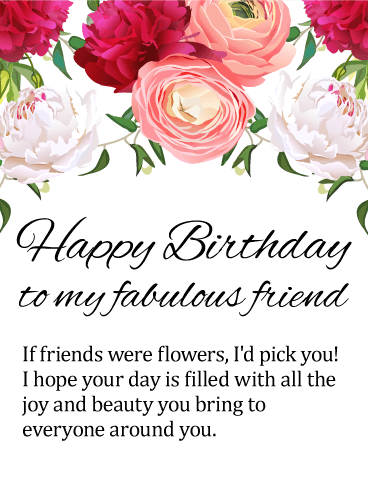 The birthday card is decorated with beautiful pink flowers, the perfect way to tell your friend how lovely and special she is! 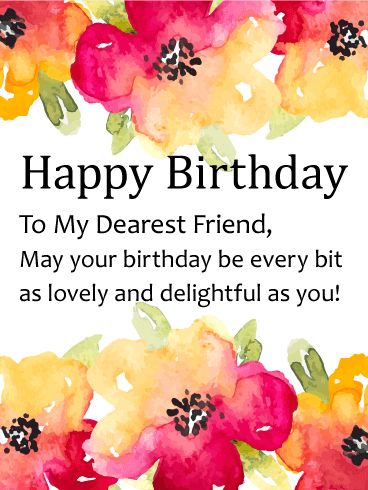 Send your "Happy Birthday" wishes with the kind, heartfelt message on this birthday card and tell your friend how important she is to you! 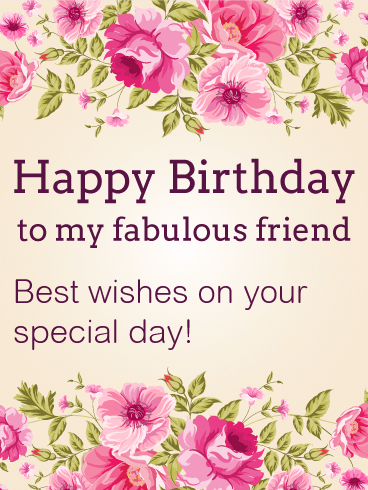 Birthdays are the best time to tell your friend how awesome she is and how excited you are to celebrate her birthday this year! 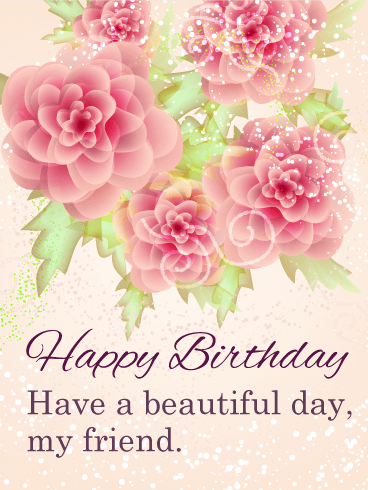 The elegant, gorgeous flowers, and pink colors add a feminine touch to this sweet card. 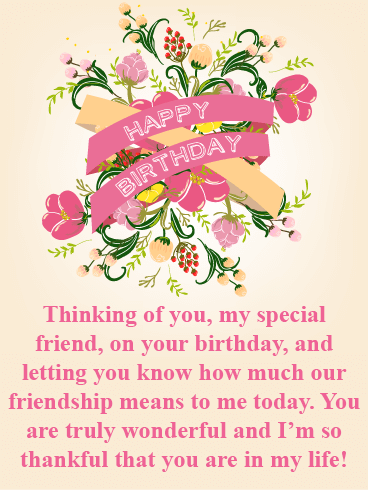 Use the touching birthday message and beautiful design on this Happy Birthday card to tell your friend how special she is to you today! 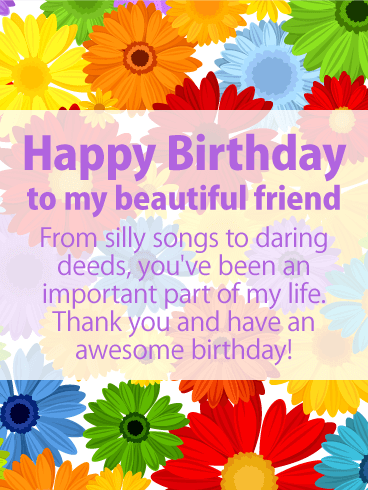 Birthdays are the perfect time to tell your friend how amazing she is and how thankful you are for her friendship! 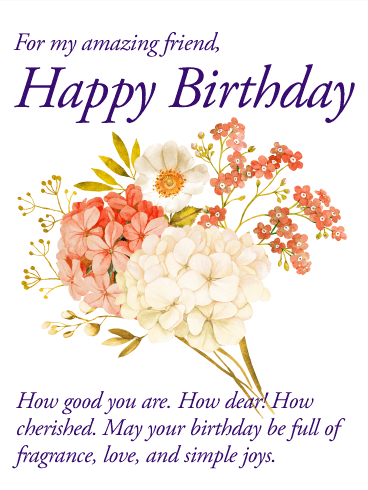 This beautiful Happy Birthday card is the perfect way to let her know. 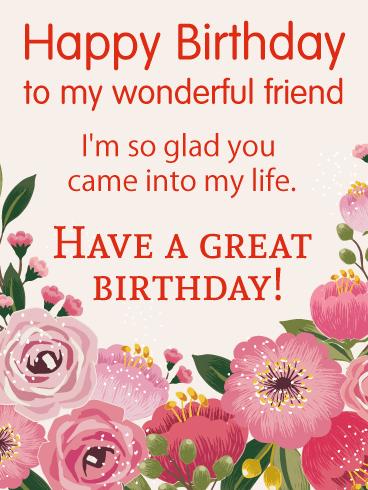 The gorgeous, delicate pink flowers, and rose-colored font reflect your friend's inner and outer beauty on her special day. 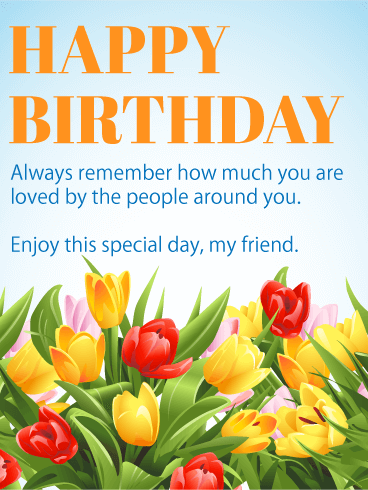 Send this birthday card to say "Happy Birthday" today!